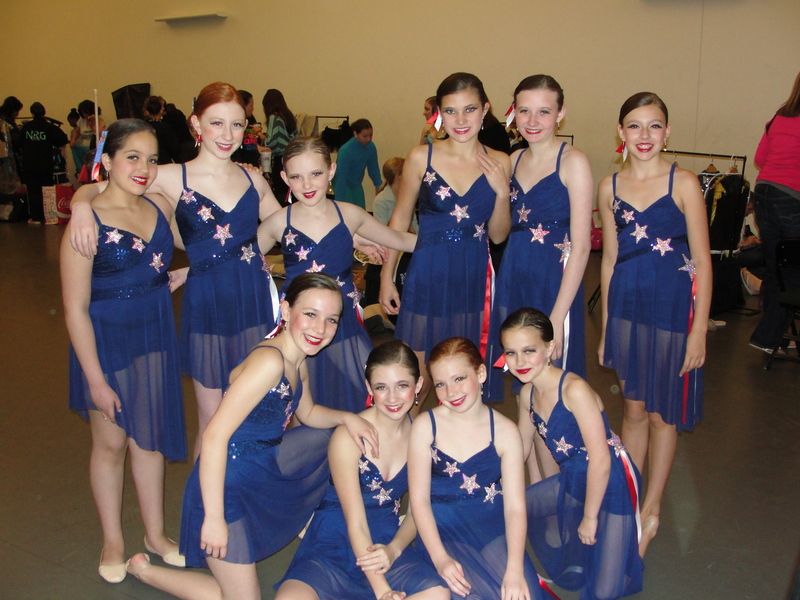 This past weekend, the Lake Area dancers attended their 2nd dance competition of the season. This time, we attended the Hall of Fame Dance Championship in St. Paul, MN. Last year, Grace and I attended Hall of Fame with Eau Claire School of Dance; you can read my last year’s post about it here. This year’s competition started on Wednesday, and ran all the way until late Sunday. It was HUGE! Thursday evening, I decided I was going to watch some of the large group dances online. I LOVED that they were live-streaming both stages! I planned on watching the few dances from Lake Area Dance, Eau Claire School of Dance, and Woodbury Dance Center (one of the girls in Grace’s class has a big sister that dances there). All the high school dancers were awesome!! I ended up getting sucked in, and watched almost the whole night! There was a group I had never heard of; Northern Force Dance Company – their dances were nothing short of amazing. It was fun watching, tweeting about, and talking about on facebook, all the dances! I got to watch many of the dancers we know rock the stage from the comfort of home, without keeping my kids up. It was kind of the best of both worlds! Friday night, the girls from Eau Claire that Grace danced with last year were competing. I picked her up from school a little bit early, and we headed to St. Paul to watch them. We got there in plenty of time to catch all 4 of their dances. Grace was a bit nervous to see them all, and was disappointed that they weren’t jumping out of their skin as soon as they saw her. I reminded her that they were just about to go on stage, and were probably nervous. Once they danced, they had time to say hello, and Grace spent most of the rest of the evening with them! It was almost as if it hadn’t been a whole year since she’d seen them! I spent most of the time sitting with, and talking to, many of the Eau Claire parents. It was great catching up. Like last year, the schedule bounced all over the place. Some dances were an hour ahead, some were dancing WAY late. This was frustrating, since we were trying to watch specific dances on two different stages. Grace REALLY wanted to watch her “big sister”, Madelyn, do her solo. Since she was scheduled to dance at a decent time, and we could sleep in the next day, I agreed. After watching some of Grace’s teammates do their solos on Stage 2, we went to stage 1 to watch some of the groups. I was checking the other stage on occasion, and decided we would have plenty of time to watch two Eau Claire duets on stage 1, and then head to stage 2 to watch Madelyn’s solo. We ran over to stage 2, only to find out that Madelyn had JUST gotten off the stage. I was so disappointed! It was still over an hour before her “scheduled time.” I had been looking forward to seeing her dance as much as Grace was. Several dances that were supposed to be before her ended up dancing after her. To make up for missing watching the dance, Grace asked if we could stick around for awards. I was so glad we did. Besides watching some great solos, Grace got to hang out with one of her teammates for the rest of the evening, while I sat with Miss Maria, owner/instructor at Lake Area Dance. I had a lot of fun hangin’ with Maria, and enjoyed getting to know her a bit better. We had lots of laughs! Saturday, we slept in, watched a few of the dances from both of our dance families online, and relaxed. Grace danced on Sunday morning. We didn’t have to be there quite as early as last year, but we did have to be there before 7. Living only a half hour away was so nice! We got up, started doing hair and makeup at about 5:30 a.m., ate a little breakfast, and headed out. Grace’s first dance was her lyrical. The girls looked beautiful! They really rocked their jazz dance, which was second! They ended up with a Judges’ Choice award for Precision. Finally, they danced their tap dance. I sat up in the balcony of the River Center, and was able to see parts of the dance I hadn’t even noticed before. It really is quite funny! They called some dads on stage for a Dad’s Dance Off. It was pretty funny! The unfortunate thing with the awards ceremonies I have been to this year, is that the background music tends to be so loud, it over-powers the emcee. Once the person with the microphone starts talking, the music should be turned WAY down, or off. The award ceremonies were very fast compared to Legacy. I appreciated this, even though it would have been nice to hear from the judges a little bit (or at least have them introduced). The Angels ended up with a High Gold for lyrical, and Platinum for both their tap and jazz dances. They tied for 7th overall for their jazz dance, and ranked 6th overall for tap. We left after the awards ceremony. We intended on catching some more of our friends’ dances online after we got home, but we didn’t end up doing so. Some things I saw at this competition that I thought were unique: a dance with taps on slippers, dances with costume and shoe changes in the middle of them, a dance with one pointe shoe and one barefoot, a step team – complete with a drum line to back them up. The step team was VERY COOL!! Grace’s old dance teacher, Miki, from Eau Claire, was backstage before she went on stage for her first dance to wish her luck. When she got off the stage after her last dance, Miki was backstage to give her a hug, and tell her what a good job she did. That meant a lot to Grace! I was very impressed too, though it also confirmed everything I know about Miki. 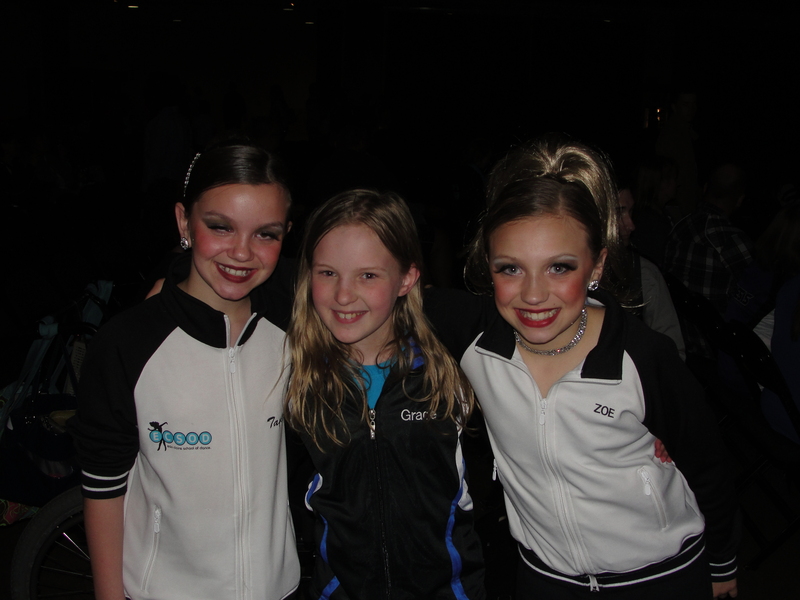 While the dance world IS competitive, I am seeing more and more positive sportsmanship at each competition. I have seen many people cheering on multiple studios. A dancer from another studio even filled in at the last minute when one of our high school girls was sick. The dancers and parents have been setting some great examples over the past several weekends. Way to go, everyone!